The hardest job in football? Forget trying to satisfy Chelsea owner Roman Abramovich's desire for trophies, or the Brazilian population's demand to win the World Cup on a four-yearly basis, Scotland's Kevin McGreskin has taken on arguably the hardest job in world football - trying to secure a first ever victory for Kiribati. Pronounced "Kiribas", the nation comprises a group of 33 islands - 22 of which are uninhabited - scattered throughout the central Pacific. In their 23 years of international football, not only have they lost all of 10 of their matches - scoring four goals and conceding 122 - they still haven't played at home. One reason could be the state of the playing surfaces. "Every island has a pitch which is almost constantly in use," technical director McGreskin told the BBC's World Football programme. "When I say 'a pitch', it's not grass, it's coral sand." Used to straddle the International Date Line, meaning that on some islands it was today; on other islands it was tomorrow! The major industry on the islands is fishing, but few I-Kiribati, as the natives are known, will have experienced busier shifts than Tiaon Miika and Tarariki Tarotu did in 2011. They were in goal for back-to-back, 17-1 defeats against Papua New Guinea and Tahiti in the Pacific Games. Miika conceded eight goals in 15 minutes during the first half against PNG. So plenty of work ahead of McGreskin, who says improving competitiveness is crucial in the plan to gain recognition from Fifa. He said: "That will give the young players on the islands something meaningful to aspire to. There's a bit of turning around to do but I'm confident that we can do that." More than prestige, that will mean Kiribati will be eligible for crucial grants that will help their development. McGreskin added: "Despite the results, there's ability amongst the group of players. What they lack is largely organisation and a little bit of fitness." And there's a glimmer of hope for the 103,000 I-Kiribati from whom McGreskin can select. The country's futsal team enjoyed an historic 3-2 win over Tuvalu in 2011. But sorting out tactical awareness and unleashing latent talent could ultimately be the least of McGreskin's problems. 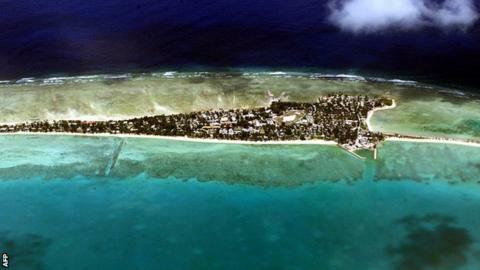 Rising sea levels are putting the islands, which are only an average of three metres above sea level, in genuine danger of disappearing beneath the waves. "That's a serious threat. From what I've heard the Kiribati government is in negotiations with (nearby) Fiji to potentially buy one of their islands so if the worst comes to the worst, they can move the country to that island." To hear Kevin McGreskin's full interview, as well as reports on Piermario Morosini's funeral and football in Bahrain and Australia, download the latest World Football podcast.